Jim Thompson, president of the Oregon Brew Crew tells the origin story of the “mystical brew day blend” that is the 2018 Homebrew Con collaborative beer. 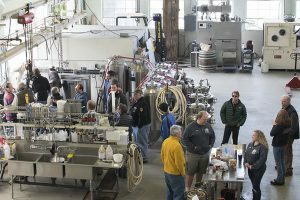 In late 2017, members of the Oregon Brew Crew (OBC) in Portland, Cascade Brewers Society (CBS) in Eugene and Heart of the Valley Homebrewers (HOTV) in Corvallis began discussing ways to create a special beer for Homebrew Con 2018. 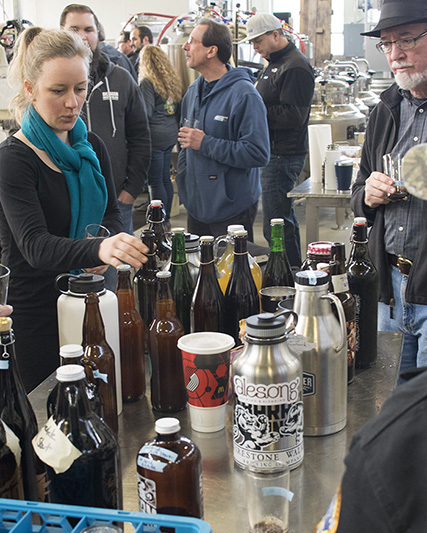 While collaborations are quite common in the commercial craft beer world (Portland even has a Collabofest now), the idea of having multiple clubs brew or blend a single beer together seemed like a fun challenge! It was too early for any hop-forward beers, and we would not have enough time to properly age three sours, so we began thinking about ways to incorporate oak aging into a style that would benefit from a 6-month rest. 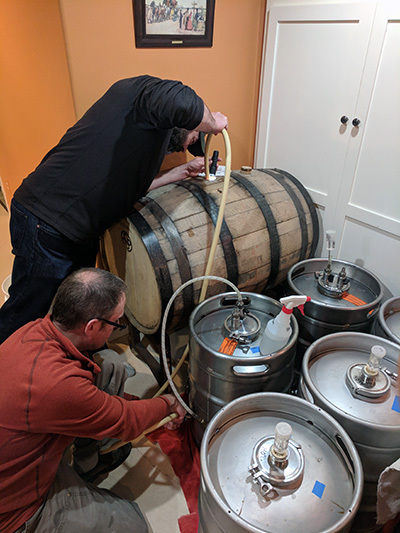 We thought about brewing separate beers and aging them in separate barrels, but a single 20-gallon barrel can be difficult to acquire, much less three of them. More importantly, we would miss the opportunity to bring club members together for a shared brew day. But where can we brew 60 gallons of high-gravity beer with room for more than 30 people? The answer was the Oregon State University (OSU) Food Science & Technology Pilot Brewery. OSU has the oldest food science department in the country and one of only a few fermentation science programs that focus on beer, wine and fermented foods. Both OBC and HOTV contribute to scholarship funds that help offset tuition costs for these programs. The OSU Pilot Plant facility has a 2-barrel brewhouse that would be perfect for our club collaboration—a system that will soon see a massive upgrade thanks to a $1 million gift from the CEO of Gambrinus Company (brewer of Bridgeport, Shiner and Trumer beers). The American Homebrewers Association’s annual Homebrew Con is the ultimate experience for the greatest hobby there is—homebrewing! If you are interested in gaining a better understanding of beer, mead and cider you’ve come to the right place. With 60+ educational sessions, a Homebrew Expo to rule them all, and the legendary Club Night, Homebrew Con is sure to become your annual pilgrimage along with 3,000 of your new best friends. Here in Oregon, there have been a few notable and celebrated commercial collaborations. Fort George Brewery in Astoria has been brewing 3-Way IPA since 2013 with local and regional breweries like Boneyard, Block 15, Reuben’s Brews, Melvin and Great Notion. Alan Sprints from Hair of the Dog (and former Oregon Brew Crew president in the early 1990s) brought together friends from Belgium and Japan for an incredible blend of complex, barrel-aged beers from Shiga Kogen and Brouwerij de Molen. Side By Side is one of the more complex beers that I have ever tasted! With liquid inspiration and a brewing facility secured, a plan was hatched to brew something in early December and age it in a large oak barrel. Rather than attempt to get members from three separate clubs to agree on a single recipe, we took a different approach. 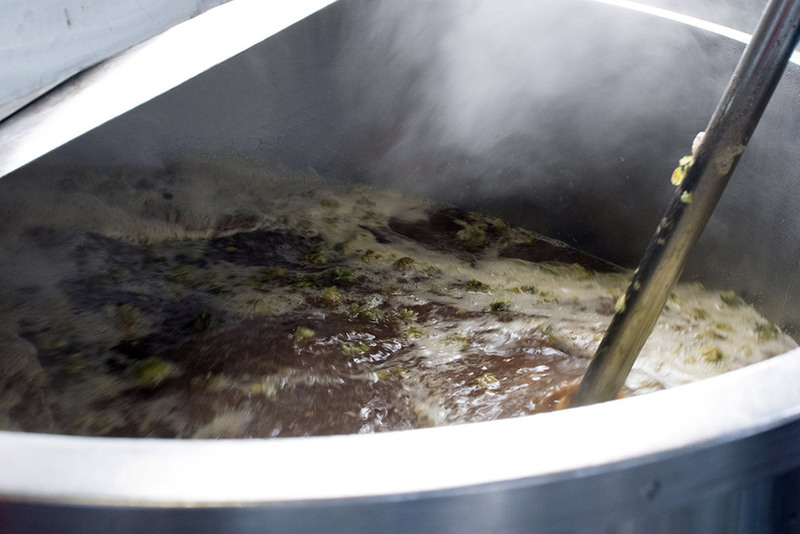 Given only the guidelines “dark” and “Belgian,” each club was asked to develop its own recipe and bring ingredients for a high-gravity, 20-gallon batch to the brew day. Participating members would have no idea of the final recipe until we started mashing in! The combined grain bill was straightforward and featured many of the usual suspects: Belgian Pilsner, US pale malt, and three types of Munich. A cornucopia of specialty malts was also thrown in, including crystal 40, aromatic, melanoidin, Caravienne, Caramunich, Special B and chocolate wheat. The next thing all the clubs thought of naturally was sugar, and the selection did not disappoint. Piloncillo, date sugar, amber candi syrup and turbinado were combined with more than 10 pounds of homemade dark invert sugar boiled down to a sticky goo. A combination of Willamette, Liberty and Mt. Hood hops gave the beer a modest 22 IBUs. Since HOTV members brew regularly on the OSU system, the brew day got underway quickly. Members of the three clubs took turns overseeing the mash, sparge and boil, with attention quickly turning to the Belgian ale yeast—a fresh “cone dump” of Imperial Gnome from nearby Mazama Brewing in Corvallis. 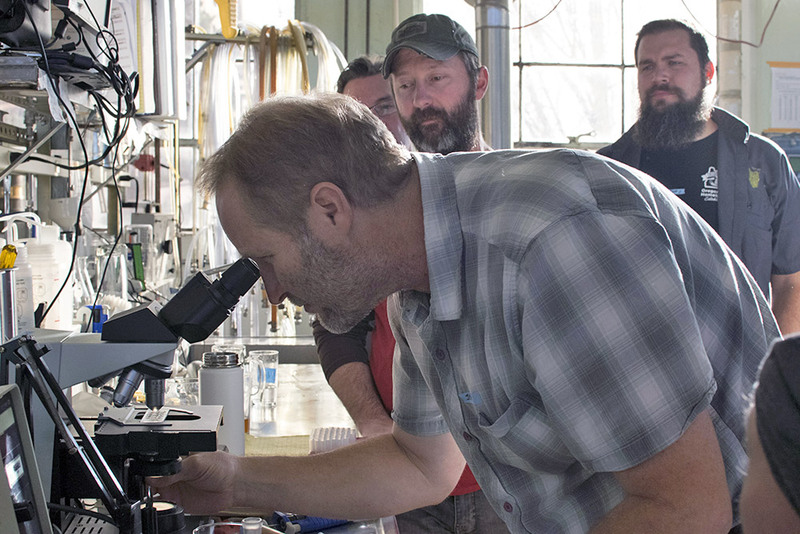 Pilot Brewery manager Jeff Clawson showed off all the cool and expensive brewing toys and then led the group through an impromptu seminar on yeast cell counts under microscopy. Although our yeast had just over 50 percent vitality, the enormous quantity of yeast would ensure a thorough and flavorful fermentation in converted half-barrel Sankey kegs. Another highlight of the day was a sizable homebrew bottle share featuring beers from members of all three clubs. Seven weeks later, a smaller group joined at the home of HOTV member Patrick Gorman to sample the beer and transfer it into a freshly dumped 53-gallon rye whiskey barrel from Oregon Spirit Distillers in Bend, where it rests quietly today awaiting its debut at Homebrew Con. If the initial tasting was any indication, this mystical brew day blend should be something really special. Look for a special tapping of this beer at the Homebrew Con Social Club.